THE ULTIMATE BATTLE Tee Design Review. THE ULTIMATE BATTLE tee is for dinosaur enthusiasts and anyone that has fond memories of the board game Twister. It is a great conversation starter and is bound to get countless laughs as well as get plenty of strange looks and "WTF's?" from onlookers. It is easy to imagine how this scenario would play out. "Right Hand Red" is called then the small armed Tyrannosaurus Rex and the four legged Triceratops just stand there confused and pissed off. Finally, they would just fight to the death. The artwork is self explanatory. 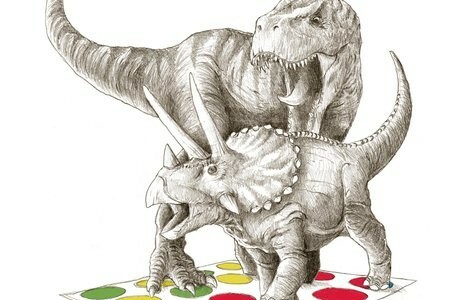 A nicely detailed pencil illustration of the two dinosaurs on a simple and somewhat crude rendering of a Twister mat which contains the only color in the design. Making it the focal point of the tee. This just goes to show that sometimes the weirdest and stupidest things as concepts make for the coolest tees. Even if for nothing else but to see the people's reactions to the absurd. DinoMike didn't add any cast shadows in order to keep the work simple. It would had looked a bit cluttered and it would had increased the ink color count. The ULTIMATE BATTLE design makes for a great casual shirt to be worn at museums, parks and Dinosaur themed movies. THE ULTIMATE BATTLE Tee Design by DinoMike.